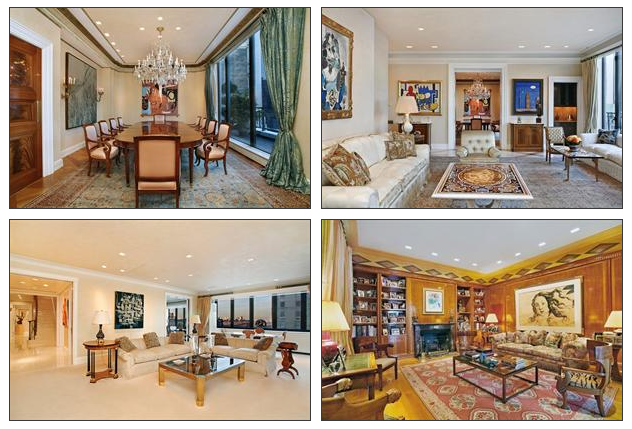 It’s the most expensive Co-op apartment ever in NYC. But whoever has this much cash available, or gets his bank to join in, will not regret it. A whooping 12000 square feet (which is about 1200 m2) and so many terraces that one was converted in an outdoor ice skating rink for a party once. The owner, Grammy Nominated songwriter Denise Rich (what’s in a name), is selling it as she suffers from empty nest syndrome. I wonder, with a house this big, if you even notice if your housemates are home or out….. The apartment comprises two floors with a total of 19 rooms, amazing views of the whole of Central Park a professional recording studio, gym and billiard room and several kitchens and full bathrooms. At $5.400 per square foot, it’s actually quite a lot ‘cheaper than the record condo — not co-op — price of $13,000 per square foot, which is what former Citigroup Chairman Sandy Weill’s triplex at 15 Central Park West recently sold for. I have yet to figure out what exactly is the difference between an co-op and condo, but my guess is it has to do with full ownership? Anyhow; not intending to buy either anytime soon so plenty of time to worry about that later.